1. mi dang hnena forward theih a ni lo. 2. download theih a ni lo. 3. print theih a ni lo. 4. expiry date a set theih. 5. sms passcode hmanga hawn theih turin a tih theih. 6. hawn theih tawh loh turin access a remove leh theih. Gmail design thar chu engtin nge ka hman ang? He thu ziah lai hi chuan Computer-ah chiah a la hman theih a, mobile phone app-ah a la hman theih loh. Computer aṭang chuan gmail.com-ah kan login ang a, login hnuah Gmail design thar hi min rawn offer lo anih chuan Gear settings aṭangin 'Try the new Gmail' click mai tur a ni, tin, design thar hi kan duh lem lo anih pawhin classic gmail-ah a lêt leh theih bawk. 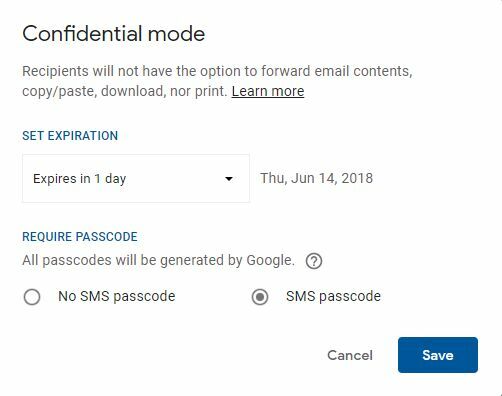 Confidential mode-a email thawn tûr chuan kan tih ṭhin dan pangngaiin compose-ah kan kal ang a, dialog box hnuaiah tâla leh sana lem inkawp a lo awm ang a, chu chu confidential mode chu a ni. Confidential email kan thawn tur chu a expire hun atan ni 1 aṭanga kum 5 thlengin a thlan theih a, tin, email lo receive tuin sms passcode hmang khera a hawn theih turin a tih theih bawk. 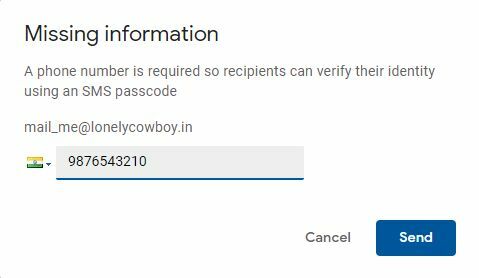 SMS passcode hmanga hawng tura kan duh chuan email kan thawnna tur phone number kan hriat a ngai thung. Confidential email kan thawn chu a lo dawngtu in gmail app (latest update) aṭangin duh chuan a lo hawng thei tawh thung a. 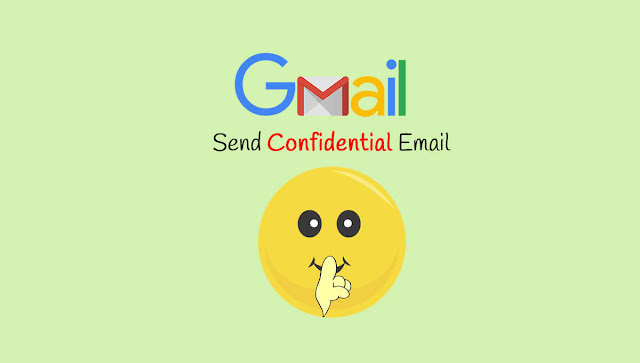 A lo dawngtu gmail ni lo, Yahoo mail-ah te confidential mail hi kan thawn anih chuan a lo dawng thei vek tho ang a, a chhunga awm en tur erawh chuan google account hmangin a sign-in leh tho a ngai ang. 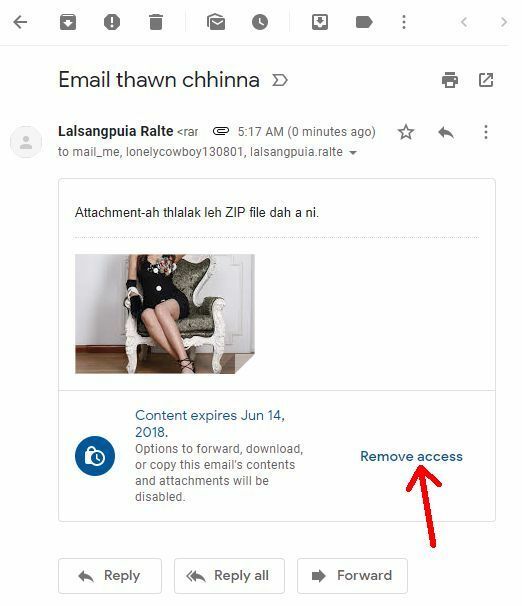 Confidential email kan thawn chu expiry date kan set aia hmaa hawn theih tawh lo tura kan duh chuan access kan remove daih thei a, chutianga ti tur chuan kan email sent items-ah kalin confidential mail kan hawng ang a, remove access click mai tur a ni. 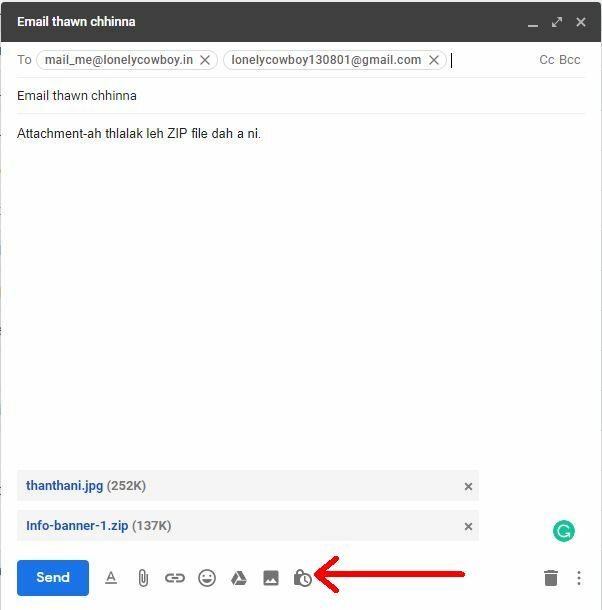 Heti zawng hi Gmail design thar te zinga pakhat confidential mode enchhinna chu a ni a, thu leh thlalak te copy theih loh, print theih loh, download theih loh mah se a screenshot theih vek tho avangin keimah bik chuan a hman ṭangkaina tur em em ka hre rih lo a ni. Thanks for reading! Video Cameraman & Editor, Freelance Web Designer & Developer, IRC Addict, Loner, An Outlaw. Sawrkar phal loh website tlawh ru ang! © 2014 - 2019 Lalsangpuia Ralte. Powered by Blogger.